While it rarely snows in Atlanta around the Holiday season, the city still manages to transform into a winter wonderland thanks to several renowned Holiday events. These Holiday events in Atlanta for 2018 will light up your smile and fill your calendar with good cheer all season long. Our Georgia car accident lawyers love to take a break and go on outings with their families just like any other Atlanta local. Of course, they are always ready for a personal injury case that can happen during this time of heavy traffic and heavy celebrating. No matter whether you’re happy and healthy or recovering from an injury, you still deserve a fun time and seasonal tidings. 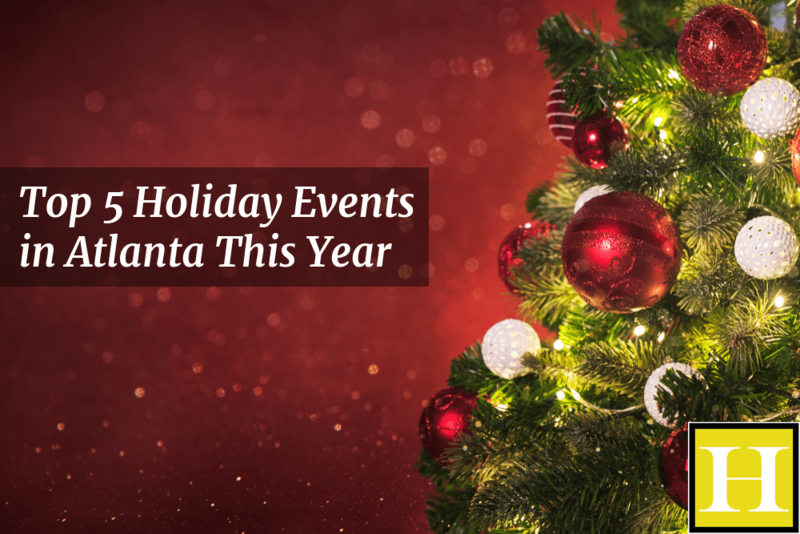 You can plan on attending the following top 5 Atlanta holiday events our partners, associates, and staff love to talk about all season long. Atlanta’s annual Holiday parade is very much for the children. We say that not just because of the amazing balloons and outstanding performers, but also because of the fact that all proceeds and donations go to Children’s Healthcare of Atlanta — a non-profit pediatric services provider, research hospital, and charity organization that makes a real difference in local families’ lives. The Atlanta Botanical Garden gets dressed to the nines for the Holiday season as part of its “Garden Light, Holiday Nights” celebration. But one day of the year is even more special because of who gets to dress up: the dogs! December 1 marks the Reindog Parade, where hundreds of proud pooches promenade. You can come watch the show, or even get a photo with Santa holding your furry friends. Atlanta’s world-class symphony has become a bit of a Holiday tradition for families all throughout the southeast. Come watch the Atlanta Symphony Orchestra joined by choruses from Morehouse College and Gwinnett’s Young Singers group as they perform classic Christmas hymns and familiar carols. Every year, Atlanta’s Atlantic Station shopping complex transforms into a traditional German Holiday market. This charming event brings vendors from all over the world who offer up unique gifts and familiar European Holiday treats. The market opens on November 17 and continues until December 23. While you’re at Atlantic Station, don’t miss the chance to take to the ice Skate the Station starts November 17 and continues until January 21. This wacky event invites runners to raise money for charity and enjoy the brisk Atlanta winter weather in a way that’s certain to turn heads! Hundreds of runners strip down to their Holiday-themed skivvies for a 1-mile noncompetitive fun run that’s all about raising money, building awareness, and creating more than a little bit of spectacle. These are just some of the big events you shouldn’t miss during the 2018 Holiday season. No matter whether you celebrate Christmas, Hanukkah, Kwanzaa, or just enjoy the year-end celebration, our Georgia car accident lawyers want you and yours to have an outstanding time this year. Remember, too, that any mishaps that happen during what is usually most wonderful time of the year don’t have to mean you’re strapped with debt. You can look to the services of our experienced attorneys to help you pursue a claim for medical costs, lost wages, suffering, and other damages from all potentially liable parties. Contact our attorneys today to receive a free case evaluation, and make sure to appreciate your friends and family during this season of giving.